SIOUX FALLS, S.D. 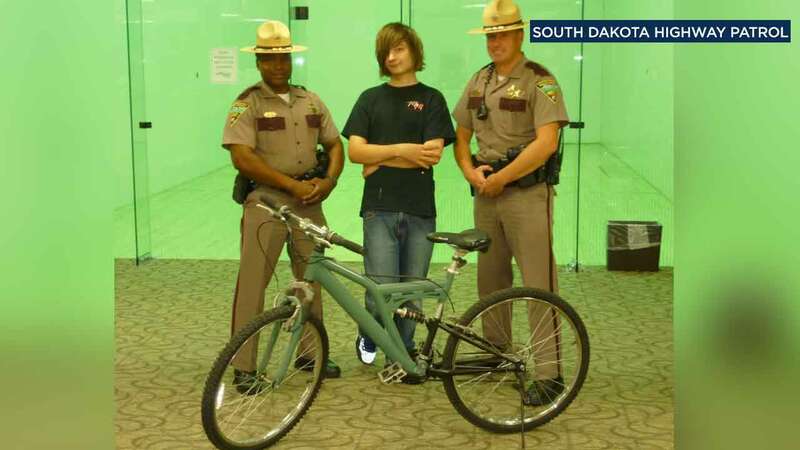 -- A teen who walks more than eight miles to and from work daily received an unexpected gift from South Dakota troopers who stopped him along the way one day, police said. Officers said they spotted the teen, Tanner, walking on Interstate 229 a few weeks ago. "After talking with Tanner, Sergeant Swenson learned that Tanner was walking to and from work, everyday, over 8 miles," the South Dakota Highway Patrol said in a Facebook post that shows Tanner posing between two troopers. According to the post, Swenson went back to his squad and discussed the situation. The officers decided to "use their resources and find him a bike." The troopers from the Sioux Falls B squad presented Tanner with a new bike last Tuesday. The Facebook post ended with, "Be safe and enjoy your bicycle Tanner."